Boudh is famous for its century old aesthetically built temples, ancient Buddha statues and caves. With the spread of Saivism, Vaishnavism and a number of other cults numerous shrines dedicated to various deities were found in this region. The natural beauty and glamor of these places keeps the visitors spellbound. It is a paradise for devotees and nature lovers. One who has visited this district at least once in his life never forgets it. Get the information about the best Picnic Spots or most popular tourist spots in Boudh District of Odisha. If you want to know the List of Famous Picnic Spots in Boudh District of Odisha then see the below tourist spot link to know about the Famous Picnic Spots in Boudh District of Odisha. Three remarkable Buddhist statues are found in Boudh are indicative of the fact that it was once a center of Buddhist culture. One of the statue is present in Boudh town. The total height of this image is 6ft. 9 inches of which the seated figure measures 4 ft. 3 inches in height and 3 ft. 10 inches from knee to knee. It is seated in the Bhumisparsa Mudra on a lotus throne 1 ft. 2 inches in height placed on a pedestal 11 inches in height and 4 ft. 6 inches in breadth. The whole image is built up in sections with carved stones. The only attendant figures are two Gandharvas flying with garlands in their hands on the sides of the head. 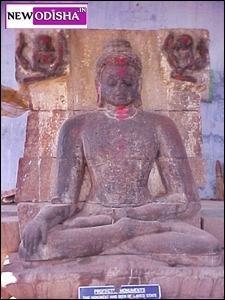 On the whole this colossus of Boudh compares favourably with similar colossi at Udayagiri and Lalitgiri in Cuttack district. A group of three temples of Siva at Boudh town called the Rameswar or Ramanath temples , dating back to the 9th century A.D. are reputed for their special feature. The decorative motifs and the plastic art of three temples at Boudh are certainly superior to and older than the great lingaraj-Ananta –Vasudeva group. One particular feature of the Ramanath temple is worth particular attention. Their plan is quite different from any other temples. In plan these temples are eight-rayed stars and the argha-pattas of the lingas are also similar.These magnificent temples built of red sandstone and profusely carved are stated to have been constructed in mid-ninth century A.D. The temples with rich texture and curved surfaces are strikingly noteworthy. Each of these temples stands by itself on a raised platform and each consists of a cell and an attached portico. The Chandra Chuda & Matengeswar temple are situated on the bank of river Mahanadi in Boudh town. Both the temples are Siva temples. In the Matengeswar temple there is also separate temple for goddess Parvati. Both these temples are built nearby the palace of the ex-ruler of Boudh. In Bhirabi temple goddess Bhairabi has been worshipped. In Madan Mohan temples idol of Radha-Krishna has been worshipped. One gayatri pragnya Mandir is also situated at the adjacent to these temples. 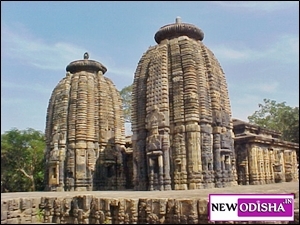 This is one of the ancient temple of Odisha. It is situated at the heart of Boudh town. Here Ratha Jatra is celebrated with great pomp and show. 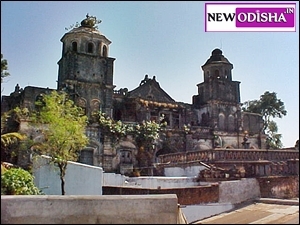 The Raghunath temple at Debagarh is situated at a distance of 14 Km. from Boudh town. The surrounding of the temple is full with natural beauty. The marble statue of Rama ,Laxman , Sita and Hanuman are being worshipped here. A beautiful pond is also here . Jagati is situated at a distance of 16 Km. from Boudh . Near the village at Gandhradi, is situated the famous twin temples of Nilamadhava and Sidheswar. These temples were constructed under the patronage of the Bhanja rulers of Khinjali mandala in 9th century A.D. These two temples were built on one platform which are exactly similar to each other. The one on the left hand is dedicated to Siva named Siddheswar and its sikhara is surmounted by a Sivalinga.The second is dedicated to Vishnu ,named Nilamadhava and its sikhara is surmounted by a wheel of blue chlorite. The principle of construction of the Jagamohanas at gandharadi is slightlt different than that of other temples. Their roofs are built on the cantilever principle and originally it appears to have been supported on twelve large pillars arranged as a hollow square. Purunakatak , situated at a distance of 30 Km. from Boudh on Boudh-Bhubaneswar road is a trading center of some importance. Goddess Bhairabi is the presiding deity of the place . The temple has beautiful entrance. Durga puja festival is observed here for sixteen days. Just opposite to the Bhairabi temple is the temple of Maheswar Mahadev. One Inspection Bunglow is in the nearby for staying. The district is rich in wild life resources. The Padmatola Sanctuary in the district can be approached from Charichhak,43 km. east on the Bhubaneswar –Balangir road and by a fair weather road from Daspalla. The distance of this place from Boudh town is 80 Km. To the end of this sanctuary the majestic Satakosia Gorge with its lush green forests and rich wild life is located. The crocodile sanctuary set up at Tikarapada ,located on the left bank of the gorge is an added attraction of this place. The meandering Mahanadi, flowing amidst the hills forms here the mightiest gorge in India, measuring 22 km long. This is an ideal place for boating, angling and adventure. Goddess Binikeyee, the presiding deity of Satakosia gorge is enshrined at the entrance. She is seen in the form of a four armed Chamundi and is worshipped according to Tantric rites. A forest IB at Sitalapani which is near to this place provides excellent accommodation for those nature loving people who want to spend a day or two. The Dambarugada mountain is situated at a distance of 21 Km. from Boudh town toward Boudh –Balangir road. The name the place is Sangrampur. The river Mahanadi flows down the mountain which makes for a visually stunning sight. The mountain give a curve look from all of its side. The height of the mountain is 70 feet. On the top it a temple of Chiatanya deva. The Nayakpada Cave is located at a distance of 12 Km. from Boudh town. in the Boudh-Bhubaneswar road. This cave was said to have been associated with mythology. Once upon a time this cave was asram of sadhus . The forest here is in rich of different types of flora and fauna .Here ,one can breathe the nature in its virgin state and truly delight in the grandeur of the flora and fauna. Marjakud is a wonderful island of Boudh. It is located on the opposite side of Boudh town in the river Mahandai.About three thousand people are living here. Maa Pitabali is the presiding deity of this place. It is an ideal place for picnic. Apart from the above places there a number other places in Boudh for the tourist . Asurgada, Siva temple at Karadi , Sarsara and Bousuni , Jatasamadhi temple at Balasinga ( temple of Mahima cult) , Paljhar are the places of interest to name a few. Boudh is well connected with road and rail with other district headquarter and the state capital Bhubaneswar. The distance of Boudh from Bhubaneswar is 240 Km. One can come to Boudh via State Highway No. 1 & 14 ( via Nayagarh –Charichhak) or can come by National Highway No. 42 . ( via- Angul).Regular train services are available from Bhubaneswar viz. Bhubaneswar – Sambalpur Intercity Express,Hirakud Express,Puri-Sambalpur passenger train. To reach Boudh one has to get down at Rairakhole station. From here one has to travel around 27 Km. either by Bus or taxi to reach Boudh. The nearest Airport is at Bhubaneswar. Give Responses for "Famous Picnic Spots in Boudh District of Odisha"